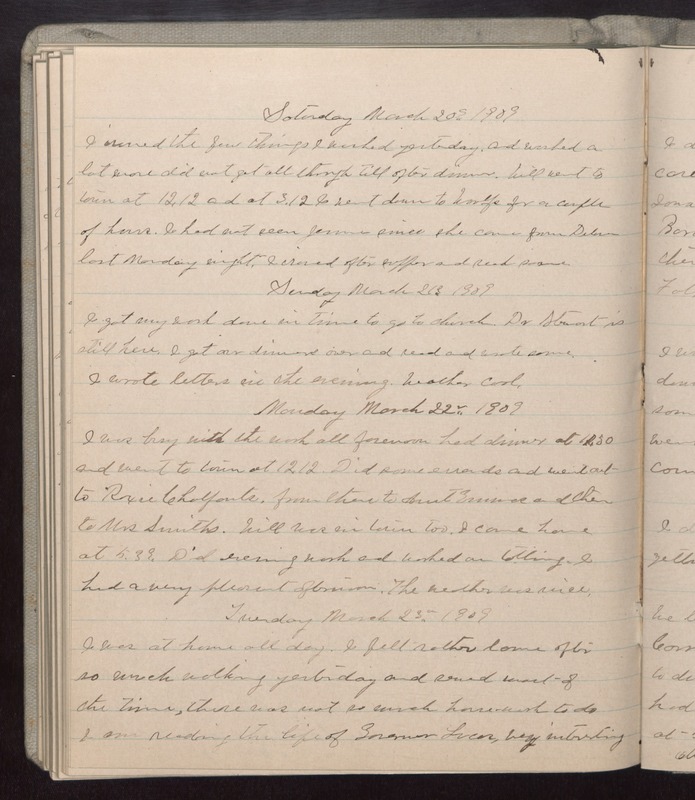 Saturday March 20 1909 I ironed the few things I washed yesterday, and worked a lot more did not get all through till after dinner. Will went to town at 12.12 and at 3.12 I went down to Woolfs for a couple of hours. I had not seen Jennie since she came from [Deloran?] last Monday night. I ironed after supper and read some. Sunday March 21 1909 I got my work done in time to go to church. Dr [Stewart?] is still here. I got our dinners over and read and wrote some. I wrote letters in the evening. Weather cool. Monday March 22 1909 I was busy with the work all forenoon had dinner at 11.30 and went to town at 12.12. Did some errands and went out to Roxie Chalfonts. from there to Aunt Emmas and then to Mrs Smiths. Will was in town too. I came home at 5.39. Did evening work and worked on tatting. I had a very pleasant afternoon. The weather was nice. Tuesday March 24 1909 I was at home all day. I felt rather lame after so much walking yesterday and sewed most of the time, there was not so much house-work to do I am reading the life of Governor Lucas, very interesting.